LOS ANGELES -- In the still of the NBA postseason, when the news is slow and the rumors are fast, the Los Angeles Lakers are making a lot of noise. Trade noises, that is. Although the talks involve Lamar Odom and a handful of disposable Lakers, the eye of the gossip swirls violently around Pau Gasol, LA's 7-foot, 250-pound center-forward, who can be electrifying on his best days, yet so painfully drab on his worst days. Gasol played all 82 games last regular season, norming 18.8 points and 10.2 rebounds per. But his numbers declined badly in the playoffs ---- 13.1 points and 7.8 rebounds ---- making it way easier for the eventual champions Dallas Mavericks to sweep LA in a one-sided second round series. Gasol is now 30 years old. He's been in the NBA for 10 years and has logged a staggering 26,249 minutes of play. When you think of the physical abuse his wiry body and weary knees have taken through the years, the word horrifying comes to mind. Maybe he is old. Maybe his fast hands have slowed and could no longer make up for the now even slower feet. Or maybe, Pau just had a bad year, like all of us tend to have as we plow through this marathon called life. The Lakers have a contract with Gasol until 2014, so keeping him is easy. Trading him is another story. Thanks to a three-year, $64.7 million contract extension he signed in 2009, Gasol is one of the highest-paid big men in the NBA. He made $17.8 million last season and is due for a slight increase yearly until 2014. With the lockout looming, Gasol's salary is the kind of payables that drive team owners and their accountants crazy. Kevin Love, the 6-foot-10, 260-pound Timberwolf, is often mentioned as Gasol's possible replacement. Only 22 years young, Love averaged 20.2 points and 15.2 rebounds last season. Statisticians around the NBA worked overtime to log his double-doubles. He is a tempting proposition, indeed. But in the end, the Lakers are likely to keep Pau. The lanky Spaniard is, after all, a two-time champion, a proven winner who, in the past, had shown the ability to perform in the big moments. Getting rid of Pau isn't the answer to the Laker woes. The answer is acquiring help at the forwards spot so that Pau won't have to toil 37 minutes a game and get burned when the playoffs roll along. The answer is getting young, athletic guards so that Pau and the bigs won't have to chase around the faster sentinels from Dallas and elsewhere. The answer lies in Kobe Bryant, in his ability to stay healthy and assume his normal role as The Black Mamba. The answer also lies in part in new head coach Mike Brown. Hopefully, can get along with his new crew. 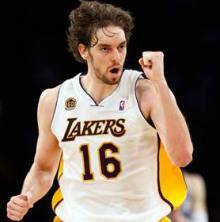 Mike Bresnahan of the Los Angeles Times projects that there is a 95 percent chance of Pau returning as a Laker.